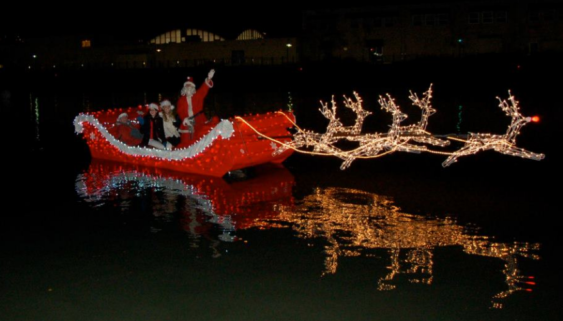 The San Rafael Lighted Boat Parade takes place annually along the entire length of the San Rafael Canal and it’s happening on Saturday, December 15, 2018. The parade is built upon the spirit of the local boating community and is actively supported by four local yacht clubs including the San Rafael Yacht Club, The Loch Lomond Yacht Club, The Marin Yacht Club and the Classic Yacht association. The parade begins as boats converge at the east end of the San Rafael Canal, across from Pickleweed Park. The San Rafael police boat “Mission City” will emerge from the Marin Yacht Club marina to lead the parade. Boats will proceed east along the Canal to the Turning Basin behind Montecito Shopping Center, and back to Pickleweed Park.